This is a public safety message from the San Diego County Sheriff’s Department. 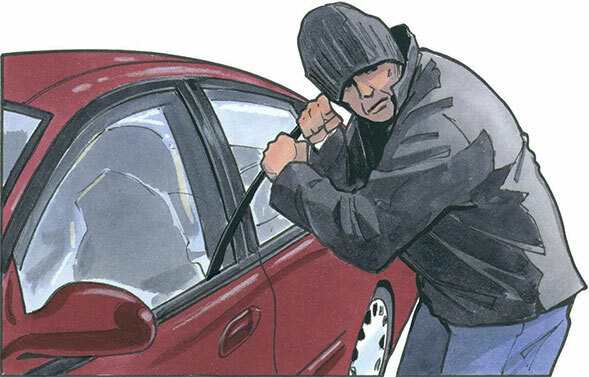 Car burglary is one crime you can really help us prevent. Lock ALL of your doors, even if you plan to be gone for only a brief time. CLOSE all your windows, no matter the weather. Never leave your car running, even to dash in a store or if you forgot something at home. Don’t leave valuables in your car. 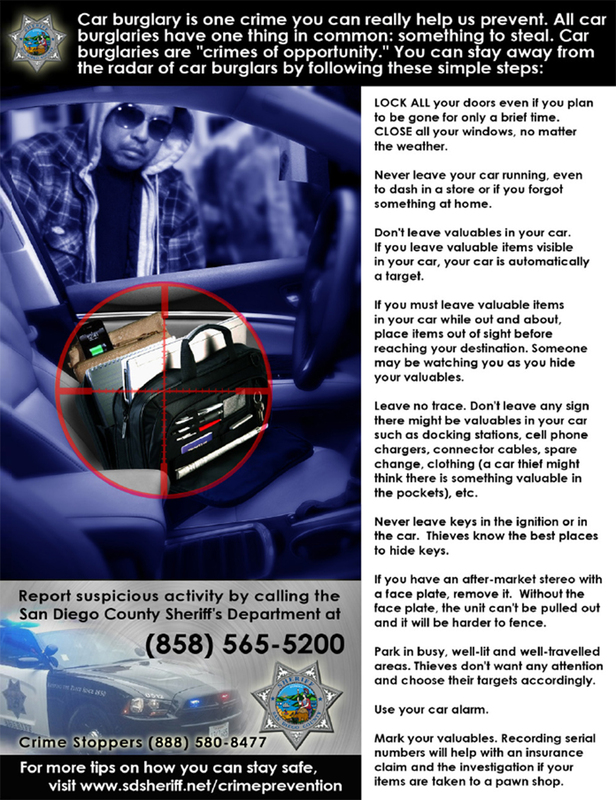 If you leave valuable items visible in your car, it is automatically a target. If you must leave valuable items in your car while out and about, place items out of sight before reaching your destination. Someone may be watching you as you hide your valuables. Leave no trace. Don’t leave any sign there might be valuables in your car such as docking stations, cell phone chargers, connector cables, spare change, clothing (a car thief might think there is something valuable in the pockets), etc. Never leave keys in the ignition or in the car. Thieves know the best places to hide keys. If you have an after-market car stereo with a face plate, remove it. Without the face plate, the unit can’t be pulled out and it will be harder to fence. Park in busy, well-lit and well-travelled areas. Thieves don’t want any attention and choose their targets accordingly. Mark your valuables. Recording serial numbers will help with an insurance claim and the investigation if your items are taken to a pawn shop. Report ALL suspicious activity by calling the San Diego County Sheriff’s Department at (858) 565-5200. In an emergency, call 9-1-1. 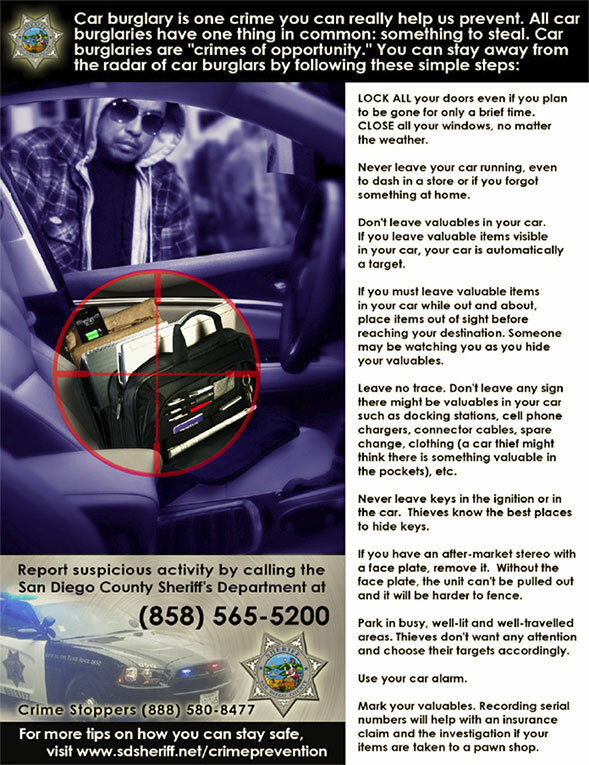 For more tips on how you can stay safe, visit: www.sdsheriff.net/crimeprevention.